Be the first to share your favorite memory, photo or story of Debra "Debbie" . This memorial page is dedicated for family, friends and future generations to celebrate the life of their loved one. 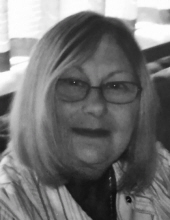 Debra “Debbie” Leah Frost, 66, of Gilbertville, died Wednesday, December 5, at UnityPoint Health- Allen Hospital. She was born April 23, 1952 in Waterloo, daughter of Robert and Joan Caley Hughes. She married Dean Lee Frost on November 7, 1981 at Immaculate Conception Catholic Church in Gilbertville. He died January 25, 2017. Debbie worked as a homemaker, raising her three children. Survived by: a daughter, Caley (David) Elliott of Waterloo; a son, Matthew Frost of Waterloo; two grandchildren, Spencer and Caden Elliott; two brothers Mike (Bonnie) Hughes of Tripoli and Dan (LeAnn) Hughes of Cedar Falls and a sister, Kim (Ron) Kelly of Cedar Falls. Services will be 10:30 a.m. Monday, December 10, at Immaculate Conception Catholic Church with inurnment in Sancta Maria Cemetery, both in Gilbertville. Public visitation will be one hour prior to service at the church. Hagarty-Waychoff-Grarup Funeral Service on 400 South Street is assisting the family. She was a wonderful mother, grandmother, wife and friend. To send flowers or a remembrance gift to the family of Debra "Debbie" Leah Frost, please visit our Tribute Store. "Email Address" would like to share the life celebration of Debra "Debbie" Leah Frost. Click on the "link" to go to share a favorite memory or leave a condolence message for the family.